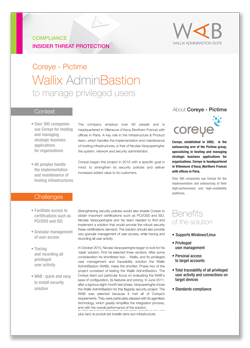 The WALLIX Privileged Access Management (PAM) solution accompanies Coreye Pictime and their customers in the hosting and outsourcing of strategic applications, as well as facilitates the company's compliance response by allowing the control of all access and activities to secure target servers and critical data. "For over eight months, more than one third of our machines have been connected to the WALLIX Bastion. The integration went really well. Whether internally or from our clients, we never had any negative feedback about the solution. The Bastion acts as a central authentication point that allows us to manage all rights and to secure all access."